Specific/General Repairs have a 90 day limited warranty on the repair and parts installed. Overhauls on bodies and lenses have a 90 day limited warranty on the item and parts installed. Flash Units, Motor Drives and aftermarket lens repairs are warranted for 90 days. Warranties are limited to repair or replacement of equipment (at our discretion) and does not include the cost of rentals, lost fee's or any other expenditures. All warranties are voided in the event of	customer damage or misuse. Northwest Camera Repair warranties all re-conditioned cameras and lenses to be free of defects for a period of 90 days from date of purchase. Flash units, motor drives and aftermarket lenses are warranted for 90 days. Warranties are limited to repair or replacement of equipment only (at our discretion) and does not include the cost of rentals, lost fee's or any other expenditures. All warranties are voided in the event of customer damage or misuse. Some items in the collectible section are sold for their collectible value only and are not covered by any warranty. 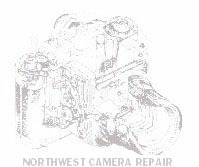 Northwest Camera Repair offers FREE UPS GROUND SHIPPING in the continental US on all orders exceeding $100.00 Please add .50 cents per $100.00 value on orders exceeding $100.00 to cover insurance. Please add $9.95 to cover shipping on orders not exceeding $100.00. United States Postal Service is available at customers expense. Please phone: (425) 252-0932 prior to returning any item you purchased from us so we may handle your return in the most efficient way possible. Returns are allowed within 10 days of invoice date and are subject to the following conditions. Items must be returned in same condition as originally purchased, with all accessories included. Original sales receipt must also be included. Items must be returned prepaid to Northwest Camera Repair. Items returned COD or shipping charges collect will not be accepted. Shipping and handling fee's are not refundable. No returns will be allowed unless these conditions are met. We accept Visa/Mastercard and US Currency. Checks returned for N.S.F. will be accessed a $50.00 returned check fee & turned over to a collection agency. Items left over 30 days will be considered abandon and sold to recover repair cost.